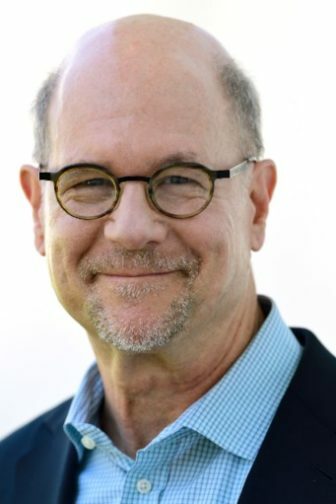 BEVERLY HILLS, Calif. — The appointment of Perry Simon as new chief program executive of PBS may nudge public television toward broadcasting more performing arts telecasts. PBS President Paula Kerger announced Simon’s hiring Monday during an executive session that opened the PBS portion of the annual summer Television Critics Association Press Tour. Simon replaces Beth Hoppe, who joined ABC News as senior VP for long-form programming in March. Early in his career Simon was part of the executive team that moved NBC from third place to first among TV networks in the 1980s. NBC’s “Must See TV” schedule of popular and critically acclaimed programs at that time included Seinfeld, Frasier, The Cosby Show, Cheers, Golden Girls and Law & Order. Simon moved on to serve as president of Viacom Productions for a decade and general manager of BBC America from 2005 to 2010. There, he commissioned the network’s first original programming, including Orphan Black, and U.S.-U.K. productions Luther, The Hour and Broadchurch. After that, he became managing director at Vulcan Productions, the media firm founded by Microsoft co-founder Paul Allen. Asked to compare the strengths of the two program executives, Kerger noted that Hoppe came from within public broadcasting. “Perry is a media executive with a broader background of experience, having worked in digital, as well as in network, and then at both Vulcan and BBC,” she said. With Simon’s hiring, PBS is poised to “look across this country and see the great art that’s being created, and help us not only discover that art, but help us also see the creativity that exists in all of us,” Kerger said. Simon serves on the board of directors of the Oregon Shakespeare Festival in Ashland. Kerger cited his long tenure with the regional theater as evidence of his “deep interest in the performing arts and theater, really nonprofit theater. To me, that also really resonated,” she said. 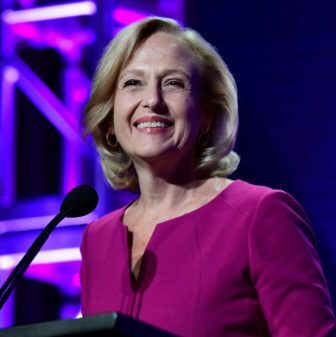 Kerger, who has worked to build a bigger footprint for arts programming on PBS throughout her presidency, said Simon’s involvement in regional arts is a key strength that he brings to the job. With Jane Chu, former chair of the National Endowment for the Arts also joining PBS in the new position of arts adviser, Simon’s appointment opens a new opportunity to expand and improve on its arts programming, Kerger said. Simon was introduced to critics at the session but offered no remarks. Kerger said he will relocate from Los Angeles and start the job in late September, at which time he will be available for interviews. In an announcement sent to station managers prior to the TCA session, Kerger said PBS worked with the executive recruiting firm Russell Reynolds and Associates to assemble an impressive slate of candidates with diverse experiences and backgrounds. ► American Experience will present a two-hour documentary on the Woodstock Music Festival that’s directed by Goodman and co-written with Don Kleszy. The film, premiering next year to mark the festival’s 50th anniversary, will focus on people who attended the festival and not the performers. Mark Samels is EP for American Experience. ► Goodman is also producing a new collaboration between Ken Burns and Siddhartha Mukherjee, Ken Burns Presents: The Gene: An Intimate History. The three-hour documentary, executive produced by Burns, is based on a book by Mukherjee, who first teamed with the documentarian to adapt his book Cancer: The Emperor of all Maladies for PBS. The new production traces the science of genetics as well as its applications, and is slated to premiere in spring 2020. ► Henry Louis Gates Jr. will executive produce and present a four-hour documentary on the years immediately following the Civil War. Reconstruction: America After the Civil War will premiere next spring and cover the years from the emancipation of slaves in 1865 to the entrenchment of Jim Crow segregation laws in 1915. ► Masterpiece will present Mrs. Wilson, a three-part drama based on the real-life story of a woman who learned that her late husband had a secret life that included multiple other marriages. The drama is set in London and India in the 1930s, ’40s and ’60s. Ruth Wilson stars as a her grandmother. Masterpiece will also bring the six-part series, Press, about competing London newspapers, to PBS. PBS also confirmed that “Won’t You Be My Neighbor,” a documentary about the life of Fred Rogers, will be broadcast on Independent Lens early next year. The telecast will mark the 50th anniversary of the premiere of Mister Rogers’ Neighborhood. The chief programmer’s achievements include a co-production deal with the BBC.